The Bubba Watson wild shot that won the Masters, Bubba Watson won the Masters with his own brand of golf, but family trumps his green jacket, The biggest moment in Bubba Watson's life-changing victory didn't surprise his mother one bit. Molly Watson walked down the side of 10th fairway in the second playoff hole of the Masters, saw the spot where her son, Bubba, had put his tee shot – deep in the woods without a clear path to the green – and knew immediately he’d find a way to swing for the pin. “That’s his game,” she said. “Bubba Golf” is what Bubba Watson calls it, and it’s some combination of aggressiveness and innocence. The guy boasts of never taking a lesson. He has no coach. He employs no sports psychologists. He does things he knows he shouldn’t, like hitting driver when control is of the essence, or imagining some weaving, looping wedge shot out of the woods and into history. “Hit a crazy shot that I saw in my head and somehow I’m here talking to you with a green jacket on,” he said. So, yes, Molly Watson sure was correct. She knew her boy. Knew he was a simple kid from the Florida Panhandle, son of a contentious Vietnam vet. Knew he learned the game hitting Wiffle balls around the yards. “Inside the house, too,” she said. She knew that as much as he wanted to win the Masters, Bubba was more focused on getting out of Augusta and back to his wife and their 6-week-old son, Caleb. They’d adopted him just weeks ago after an emotional, roller coaster of a process, and none of this seemed to mean as much anymore. She knew that as much as her late husband, Gerry, always said Bubba’s greatness was possible, it wasn’t in Bubba’s mind to believe it. He was a kid who would assume the worst yet play carefree anyway. When you assume it won’t work you might as well try something that shouldn’t. Bubba Watson was in a playoff with Louis Oosthuizen for a green jacket, so what if he’d cranked into no man’s land? He knew he had a swing. So they parted the gallery for him. He tried to take measure of where a green was. He couldn’t see it behind the patrons and a television stand. He grabbed his 52-degree gap wedge and from 164 yards to glory he let rip the most perfect Bubba Golf shot ever. It wound up in the middle of the green, where he would need a simple two-putt to win the Masters. As he ran out trying to follow its flight, fans jumped forward and patted him on the back and ran right along with him. Soon he and Molly were hugging and crying at the center of the green. Neither could say a single word. 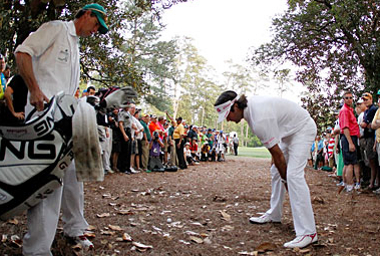 Bubba isn’t quite your prototypical “Bubba,” but he’s the closest they’ve ever seen at Augusta National. He recently rewarded his success by purchasing the original General Lee of “Dukes of Hazzard” fame and is restoring it. His wife, Angie, was in Florida, watching on TV, trying to get Caleb to take a nap. She was trying to figure out what he was going to do to celebrate, “You know he’s gonna put on the green jacket and drive down something in the General Lee,” she told the Golf Channel. And as for next year’s champions dinner, where he’ll pick the menu? “Might be In-n-Out cheeseburgers,” Angie said. Everyone was laughing Sunday because it had all worked out, and they all knew how close things had come to breaking bad. Bubba was always talented and always headstrong. He says early in his career he was overwhelmed by everything. It was a terrible mix: no balance, no focus. Angie sat him down for a long talk. His caddy threatened to leave him. He said he gave himself to Christ. All helped, but he acknowledges it’s been “a slow process.” It still is. Part of his recent emotions came from finding his son. On their first date Angie told him she was incapable of having children. “I said, ‘That’s fine.’ ” Various family responsibilities, including the death of his father in 2010 to throat cancer, prevented them from seeking adoption sooner. They finally went after it this winter. The adoption process can be painful for would-be parents, hopes rise and then are dashed with cruel regularity. On March 19 they thought they had a baby and then got turned down at the last minute. “Heartbreaking watching my wife,” he said. They were willing but Bubba had to play that weekend at the Arnold Palmer Invitational outside Orlando. He wanted to pull out, but Angie made him stay. He finished fourth, a fine tune-up for this. “Then Monday morning, we were down in South Florida, picking up little Caleb,” he said. Watson began to tear up again. He meant it. Even during the green jacket ceremony, he kept thinking about a private jet waiting for him at the airport. He saw a helicopter and wondered if it might be about to whisk him out of Augusta National right then. Most Masters champions want to stick around, soak up the memories and the moments and bask in the glory of what may be their greatest accomplishment. “The thing is, golf is not my everything,” he said. This is the most staid, traditional, secure-of-itself place in America. It changes for no one. It’s convinced it is everything. Bubba Watson came a long way, the hard way, his own way, to get here. The guy can really play golf. He just isn’t obsessed with every last facet of the game, doing it how everyone else does, playing it safe when he should. Bubba Golf just won the Masters and now all he wanted to do was go home and avoid changing diapers. And that, too, is just what Molly Watson expected.